Recently we purchased a home and moved. It required a lot of work and, though I had moved hundreds of times before, this move seemed the longest, most grueling and hard. We had far less stuff to move this time since we had downsized considerably over the years and I’m into decluttering and being organized. It was our first home and the thrill of that should have filled me with energy but instead, I was so wiped out through it all that I dragged myself through all my work as slow as a slug. I usually have so much energy and pep, I’m the queen of multi-tasking, a roosterette up before the neighbor’s rooster, stronger and more driven than some women half my age. What happened? Then after our move, I did get more energy and started working from sun up to sun down with all our gardening and planting trees, scrubbing and decorating. But then one evening I was sitting on the front porch steps repotting geraniums and I started to feel like I was having a stroke (not really but the only description I have). I stood and stretched, I walked about, I lay on the bed and did some breathing. I got worried enough to think about a drive to the hospital. But first I needed to bath. Well, I smelled like manure and fish emulsion. I do have my pride even during a stroke. I got on the web for info on what did a stroke or heart attack feel like and all I got out of my research was to drink a glass of water. I did and lived to write this blog. Turns out I had esophageal spasms. The next day I decided to celebrate my survival and our house and have a bar b q with friends to christen the place. I also decided to finish my garden beds. My husband was on FaceTime with family in India showing off the house and when I started to chase the boys around pretending to be a TRex, he started filming that. But then I bent down to get a ball and my back went out. I wound up rolling about on the driveway for all of India to see until I shouted at my husband to get off the phone. I had to roll myself into the shade so I wouldn’t fry on the pavement. After 5 visits to my new and fabulous Chiropractor, I am back to being busy. Then the other day my littlest came down with a stomach bug and threw up for a few days. I thought I came down with the same thing the fourth day when I found I couldn’t rise from the bed all day. I felt like I had eaten a terrible meal and I was so exhausted that I slept or drifted in and out of being awake all day and night with a grannie blanket on me despite the 93-degree weather. I never threw up and the next day I woke up with all my old energy and pizzaz returned! What was going on? I found this great book in my cupboard. 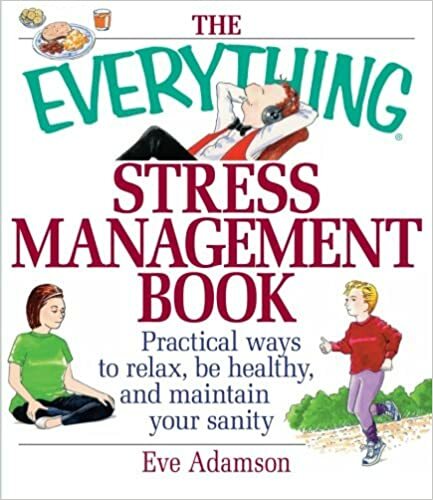 A friend had some old books that she gave me and I took it thinking I’d never read it and now I can’t wait to get on the treadmill to educate myself on this topic of stress. It turns out that even wonderful things can cause stress and after a while of good life changes or hard ones and that constant stress, our hormones become a mess and we grow listless and exhausted or start having ailments abound. I’ve had a ton of change, huge change in the last 8 years. All great but stressful and completely unlike the first 38 years of my life. The first 38 years were hard due to a rough childhood with a mentally ill and alcoholic mother and then my own self-created hell with self-esteem issues and my addictions and poor choices. moving, new town, first time home purchase. new child. A child leaving the nest. poor diet. Not enough exercise. The list goes on. The good, the bad. Basically, change and fear, poor habits, not enough sleep or working in a job that is too demanding or you just despise. What can be done about all this stress? changing our attitude and mindset around life, work, family. taking up a daily exercise. stay away from sugar and processed food. be sober, get sober, stay sober. Drugs, booze leads to misery, poverty, depression, and poor health. unplug from all the media, Iphones, FaceBook, and Twitter. get involved in a community activity that is fun and you make healthy friends. volunteering. Helping others takes us out of our misery. read positive and inspiring books. watch positive and inspiring movies. re-brainwash yourself to think joyful, positive, and upbeat thoughts. build a relationship with God. He will give you all the support and provision you will ever need. take up hobbies such as knitting, painting, things that you focus and create. quit the job and become a housewife or stay at home mother. don’t worry about the world. God has it all figured out. Do what you can and go on and enjoy your world. I have taken it down a few notches with the military style work mode. I sleep in a bit with my children. I am back to work on my fictional books that have been waiting patiently for me to finish their stories. I color with my 3 year old and I am adding hours of play, reading, and fun to the day. Life is too short and I have to be reminded of this. Previous Time to get back to writing…but how? Glad you are settling in to the new house and taking some time to be with the boys and nourish yourself. “Take Time for Your Life” by Cheryl Richardson is also a terrific book (Hay House). Now that I am in my 40s as well, I am committed to play time for myself. For me, that appears as my love of American Girl dolls and my doll blog Dolls Between Us where I like to write fiction. Men collect car models and play with drones, and I claim dolls for my play! I think I came across your doll blog a year ago. Could be! I ave both blogs but they tick different interests of mine. It’s a blessing! I wanted to say that I really like the way you set up your blog that I read. I like the sections and tips. I thought of doing something like that but I don’t want to copy your smart idea. I do think I’ll try to do shorter blogs though. Feel free to adapt it! I don’t mind at all. I sometimes am concerned that blog posts sound preachy or holier than thou. I’m definitely am a work in progress. The shorter format is a way I can share things beyond frugality. Yes, I really like how you have a little bit of something in each blog. Sometimes I just want to share a little of this and that. I’ll probably stick to my story telling but sometimes I may do that. I really enjoy your blogs. I enjoy your writing style a lot, too! Did you see in Last week’s post that I am reading your latest book? I’ve got some highlighting going on in there! I enjoy the way you relate your personal truth. I saw that you said you were reading it, yes, and I meant to thank you but God knows what distracted me…I wish you would write a book so I could have that inspiration but I just go to your website and enjoy some of your write ups now and then. Love, love, love this post. Thank you………..I need to read these words today and now I need to live by them. Thanks again. I love when my shares find that person who needs to hear the words.